FACT CHECK: Does Chicago Have 3 Times As Many Murders As New York City? Newsmax TV host John Cardillo said in a tweet Sunday that Chicago experiences about three times as many murders as New York City. “Chicago has around 3x the murders of NYC, and a PD less than half the size,” Cardillo said. The FBI reported that Chicago had about two times as many murders as New York City in 2017. The city had about a third as many police officers as New York City in 2017. Cardillo cited the statistics as part of an argument that Jussie Smollett, an actor on the Fox television show “Empire,” wasted police resources and time by alleging that he was the victim of a racially motivated attack in January that some sources later said was staged. More than a dozen detectives were working on the case, The Chicago Sun-Times reported. “He had superficial injuries, and while the ‘hate crime’ component was there, it was highly unusual to assign a dozen detectives and several FBI agents,” Cardillo, also a former New York Police Department (NYPD) officer, told The Daily Caller News Foundation in an email. Chicago does have a higher number of murders each year than New York City, but not as high as Cardillo claimed. 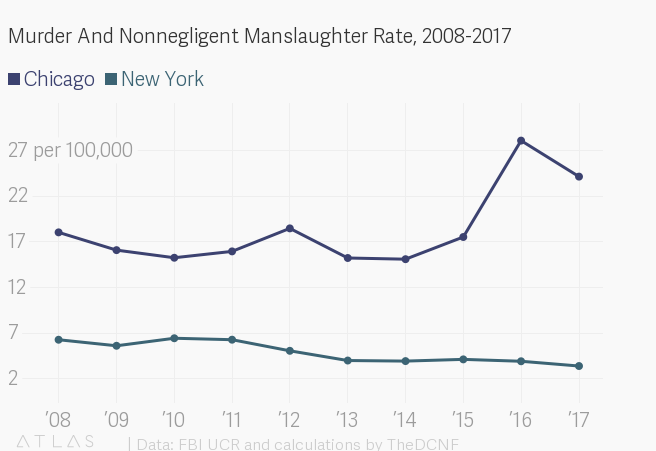 There were 292 murders (including non-negligent manslaughter) in New York City in 2017, while Chicago had 2.2 times as many that year at 653, according to figures from the FBI’s Uniform Crime Reporting (UCR) program. The FBI gathers police data and reports only crimes known to police. The Sun-Times reported a slightly higher number: 664 slain in Chicago in 2017 by New Year’s Eve. Chicago surpassed New York City in the number of murders known to law enforcement in 2012 with a sharp spike in 2016, according to the FBI UCR system. The trend continued in 2018. New York City police data show 295 murders, while Chicago police reported 561 homicides that year. Cardillo correctly said that Chicago has less than half the police force of New York City. The NYPD had 36,378 officers in 2017, while Chicago had an officer force about a third of that size with 12,383 officers, according to the FBI UCR system. When including civilian workers, Chicago had around a quarter the number of total law enforcement employees: 13,566 compared to 52,079. Chicago, however, had more police officers per capita: about 456 officers per 100,000 residents compared to New York City’s 422 per 100,000 residents in 2017. Cardillo issued a follow-up tweet Monday correcting his figures following an inquiry from TheDCNF. Correcting this tweet with updated numbers. In 2018 Chicago saw about 2x the murders of NYC, and the CPD was about 1/3rd the size of NYPD. Roughly 13,500 sworn in CPD, 38,000 sworn in NYPD. 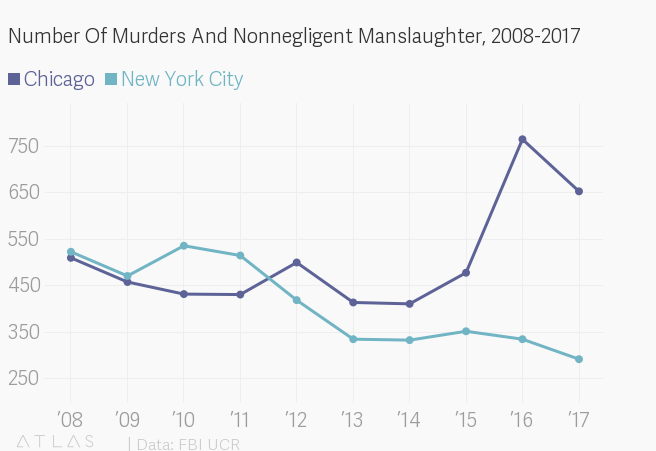 While Chicago did have about twice as many murders as New York City, its murder rate, which accounts for population size, is much higher – 24.1 per 100,000 people in 2017, seven times New York City’s rate of 3.4 per 100,000. The FBI cautions, however, that its reported figures should not be used to rank or evaluate law enforcement agencies by effectiveness due to local differences in economic conditions, population density, demographics, crime reporting practices and other factors.